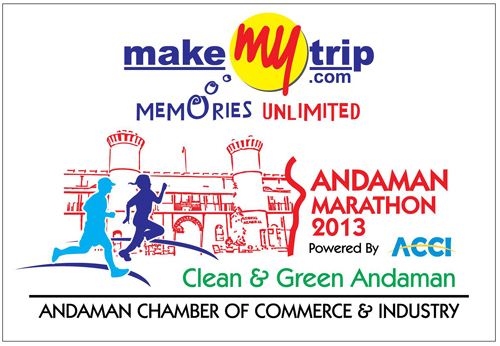 Port Blair, Oct. 30: Andaman is all set to again host for the most happening international event in the islands, ‘MakeMyTrip Andaman marathon -2013’. The marathon is the third annual event in the series, starting in 2011 with a 10K and later upgrading it to two categories, the 10K and half marathon in 2012, thereby opening up participation for foreigners. This year too, the event has been planned in a big way by the Andaman Chamber of Commerce & Industry (ACCI) in association with the Directorate of Sports, A&N Administration considering the success achieved during the last two years. The event scheduled to be held on 24th Nov. 2013 has included MakeMyTrip as the title sponsor while Actor Rahul Bose continues to be the brand ambassador. Addressing a press conference today at Hotel TSG Emerald View, Port Blair this evening, the Chairman of the Marathon Committee 2103 Shri Mohammed Jadwet explained that entries for participation has already started pouring in from foreign participants, much before the formal announcement is made. It’s a good sign said Mohammed, who expects the number of participants to increase further. In 2011 when the maiden Andaman Marathon was launched, there were around 500 participants which had jumped to 870 the next year. “We are expecting around 1000 participants this year including Indians and Foreigners, which is also the maximum limit as decided by the Committee”, said Shri G Bhasker, President ACCI. Meanwhile, the Committee announced that the Hon’ble Lt. Governor, A&N Islands, Lt. Gen. (Retd) AK Singh has agreed to flag off the Marathon from the National Memorial Cellular Jail and would be distributing the prizes to the winners. The Lt. Governor had also requested Actress Gul Panag for her participation, but due to her prior engagement she is not able to make it this year. Nevertheless she has assured her participation to the Lt. Governor in the next mega event scheduled in 2014. As a star attraction, the Andaman Marathon 2013 would be graced by none other than the Flying Sikh of India, Milkha Singh who is expected as the guest of honour. The pride of India Milkha Singh had also agreed to visit the islands during last year’s marathon. Unfortunately due to health issues, he was not able to make it, said the Chairman Shri Jadwet. The Committee Chairman also took the opportunity to express gratitude to the Andaman & Nicobar Administration and to the Andaman Nicobar Command who have voluntarily agreed to support the mega event in all possible manner. The Prize money continues to be the same like last year i.e. Rs. 1 Lakh as the first prize, Rs. 50,000/- and Rs. 30,000/- as the second and third prize respectively. The Committee is also planning to have special prizes for the senior category winners and for the first Indian. The registration charges for this year has been fixed at Rs.500/- for the Half Marathon and Rs.300/- for the 10-K event and all registered participants will be provided with T-Shirt and running bib and on successful completion, certificates and medals would be distributed. The registration is now open and can be done either online or forms can be availed at ACCI office and at the Netaji Stadium. The official website for the Andaman Marathon is www.andamanmarathon.com. Also regular updates are posted on the official face-book page of Andaman Marathon www.facebook.com/runandaman.